The backlash hit. In this encounter, the party's Telangana state secretary Hari Bhushan and another key leader, Chokka Rao, fell down. Police also confirmed their deaths. All 12 people, including key leaders and six women, were killed in the encounter. Among the dead women are Hairy Bhushan's associate Sammakka alias Jyoti. Police Commando Sushil Kumar also died in counter-attack. Maoist Central Committee member Azad was injured in the same incident.Rs 30 lakh cash reward on Hari Bhushan. After division of the state, Hari Bhushan was appointed as the Maoist party secretary of the Telangana state. Since then, he has been making intense efforts to increase operations in KKW (Khammam, Karimnagar, Warangal) division in North Telangana. There are many special operations for Hari Bhushan in the hit list ever since. Hari Bhushan has about 50 cases, police sources said. He has a cash reward of Rs 30 lakh. In recent times, Hari Bhushan, Khammam, Karimnagar and Warangal have been informed that Mao's activities are increasing. Police sources said that he had over 50 cases and that he had escaped the police several times. It was exactly two years ago (on March 2, 2016) that killed seven of its members, including South Central Zone Secretary Lachannah, in an encounter with the Bhadradri district-Chhattisgarh border. 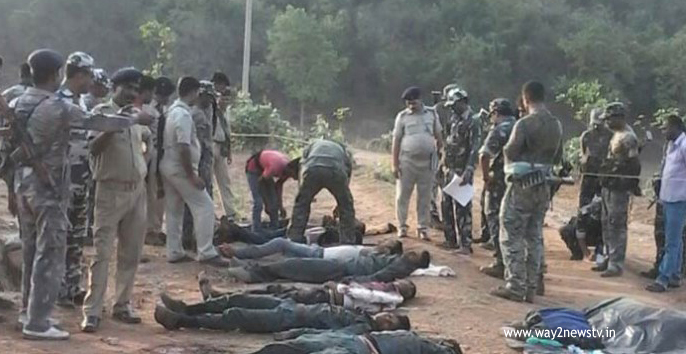 Chhattisgarh Police sources said that Hari Bhushan was also involved in the encounter. But the Telangana police dismissed the statement. It was also reported that Haribhushan was found dead at the same time as a key leader. The police who had been tried for years had finally announced Hari Bhushan's murder in the Chirala encounter. Some Maoist sympathizers approached the High Court in the encounter. The motion petition was filed on Friday .In order to judges in the case to arrest and torture the leaders before the police.What happened?.According to the information provided by the police, the Bhadradri new district of Chirala Mandal near Thondapal is meeting the Maoists and the Greyhounds-EOW forces have moved on. Maoists who came to know the arrival of the forces have started firing. Police forces also faced off.